At Snappie Studios we have a wide selection of Photo Services of which is why we are one of the best in the business and whatever your photos needs are, just pop into store and our photo advisers will be able to help you get what you need. With experienced staff and equipment for processing, we can produce quality black and white vibrant colour prints from your film, photo and digital. Our fast developing and printing services are all done on site and we also have a one hour processing service thus meaning you can drop your film or memory card in store and pick up your prints within the hour or while you wait. However if you need your prints sooner and obviously you are in a hurry, then you can use our instant printing service of which we will process and print your photos while you wait in store. At Snappie Studios we scan photos, slides and negatives using the most up to date equipment to ensure you get the best possible results every time. We do also transfer cine films and home videos to DVDS in order to protect your precious memories. Treasured Photographs over time can fade or becoming damaged but at Snappie Studios we can scan and retouch the back to their former glory. Latest digital technology is used to restore your images and you will be amazed at how well we can restore your image. We can also can also colorise black and white and sepia photographs or apply photo art effects to your more recent images. Whether it's a picture of a toddler, a doting granny and their first grandchild, a couple or family portrait, at Snappie Studios studio offer a fun, relaxed, and professional photo shoot that perfectly captures the moments and the subjects personality. We do make allowances for your input and accessories that will make you feel comfortable and let your personality shine thru. Corporate photography is also entertained for professional looking reports and websites alike so is business printing for high quality printing of your business. Convert special photos, videos and cine films to DVDS as cine films and VHS tapes deteriorate over time and not to mention the equipment for such movies are becoming extinct. So if you have old videos and cine films of family weddings, birthdays and anniversaries lying around the house it's time to bring them into store and let our digital image specialists transfer such precious memories onto DVDS so they can last longer and enjoy them for years to come. We also offer a bespoke service so if you need us edit your cine film or video, add titles, music and transitions between scenes for you before it goes onto DVD, we will be happy to oblige. Transferring old family cine films and videos to DVD makes brilliant gifts for all occasions such as Christmas, birthdays and anniversaries. We also transfer your digital files and video files onto DVD and that way is a great way of preserving your memorable digital images taken from your smartphones, iPhones and iPads alike. Bulk Scan a lifetime of memories at Snappie Studios, thanks to the popularity of smartphone, iPhones and iPads alike. We take countless pictures over the course of a lifetime, most of which we never print. In addition to this, most people have shoeboxes full of old prints and slides of weddings, anniversaries, graduations and family members tucked away somewhere out of site. Such images filled with memories of family and special occasions, with friends and loved ones, can be easily destroyed if not stored properly, so bring them into store and let us bulk scan them into digital files for your use. At Snappie Studios we also offer a restoration, retouching, and colourisation service, eliminate tears, scratches, water damage and unsightly marks that are usually associated with old photos. 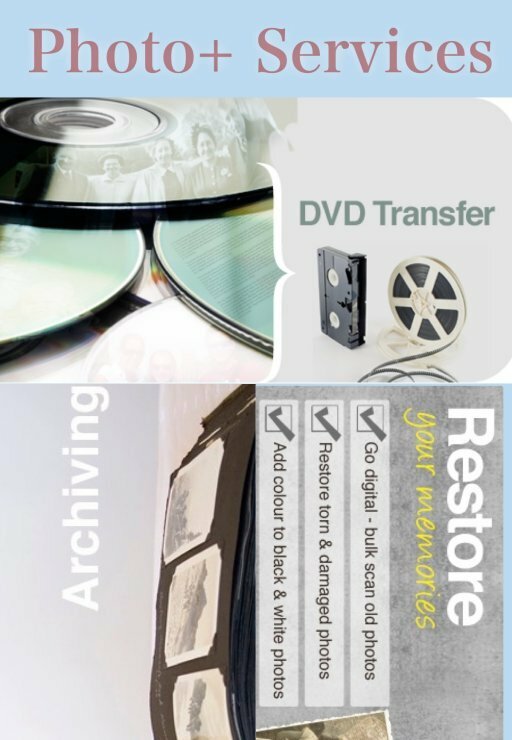 We can also transfer old home movies to DVD, ensuring that your images and movies are preserved for the next generation.